On Saturday January 25th a wine tasting was held by Pattaya International Ladies Club at a beautiful Villa in the grounds of Siam Country Club. Our arrival was greeted by Helle with tasting sheets and information about the wines for the evening. The wines were provided by World of Wine, with a glass or two of bubbly (Brokenhill Estate Charles Steiner NV Brut) as a welcome drink. Having seated ourselves poolside on what proved to be a relatively cool evening we moved on to sample a selection of wines. Australian and Chilean of both the red and white variety were presented with water, cheese and walnuts to ‘cleanse’ the palate. There was much discussion about the various merits of the wines tasted with many opting to buy their favourite on the night. 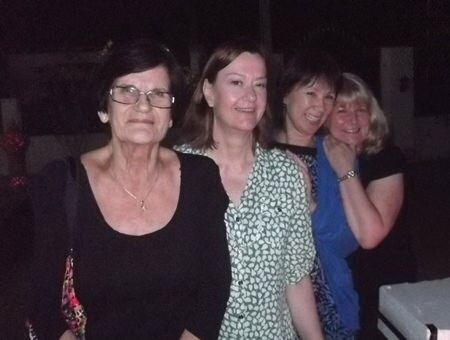 (L to R) Gisela de Wit, Helle Rantsen, Georgina Ong and Sue Tait enjoy PILC’s wine tasting evening, a delightful gathering of people having a lovely night out whilst generating funds for charity. After our ‘New World’ wine tasting presented by Darren and Louise we were ready for the delicious buffet provided by our hosts, Christine & Neil and PILC with a few extra items contributed by some of the guests. Throughout the evening a silent auction was held featuring a gift voucher from Bangkok Hospital Pattaya, our sponsor. Additionally, hotel vouchers were on offer along with various art pieces and, of course, a big basket full of great wine. We had a very entertaining evening, meeting new people, greeting friends, sampling good quality wines and eating lovely savoury and sweet delights. It was a delightful gathering of people having a lovely night out and enabling us to generate some funds for PILC charities at the same time.